Please spend a few minutes reading NOTES below and BLOG page photos and PRICING page before emailing - to avoid wasting time. A thickness of LESS THAN 500gsm is TOO THIN for a professional business card! 1) Extra Thick GOLD FOIL BUSINESS CARDS with black letterpress printed text and GOLD FOIL EDGES (gilded, gilt edges, edge foiled, gold edged, edge painting, edge painted business cards) on Colorplan 540gsm PRISTINE WHITE NATURAL GRAINED UNCOATED CARD. 2) Various metallic and opaque hot foil letterpress business cards - red and satin silver foils on dark grey card, gold foil on ebony black business card, pink and grey foils on pale grey card, aquamarine and grey foils on pristine white card, blind embossed 'hello' on mandarin card, silver on turquoise card, copper foil and blind deboss on dark grey card, white foil on bright red card - all card colours are from the "Colorplan" range - 540gsm or 700gsm card. 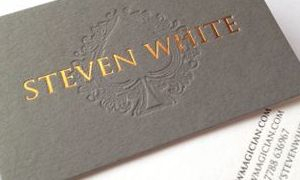 3) BESPOKE LETTERPRESS GOLD FOIL BUSINESS CARD with BLIND EMBOSSED (debossed) logo on Colorplan Pristine White 540gsm card. 4) Various opaque foil colours - extra thick letterpress business cards - green and white foils on real grey card, blue and grey opaque foils on white card, red foil on white card, satin silver and deep pink foils on white card, blue and green letterpress business cards on pristine white white card, white and red opaque foils on ebony black card, black foil on white card - all examples are printed on Colorplan 540gsm or 700gsm card. They've arrived! The quality of the cards is amazing - Many Thanks. "The business cards were hot foil printed (and blind-debossed) on extra thick (540gsm) Pristine White Colorplan by David Ward of David Ward Printing, whom we highly recommend for his professionalism and for the quality of his work. " EDGE PAINTED business cards - or in this case EDGE FOILED business cards. Over the years I've had various styles of business card for myself - this is the latest version. This card is G F Smith Colorplan Ebony 540gsm, printed and edged with ROSE GOLD FOIL, it also has a small blind embossed (debossed) logo. I chose this style because I feel gold foil especially, is best suited to a minimalist understated style (less is more) - the typeface TRAJAN is an elegant traditional font I often like to use for a classy business card. I've kept the content to a minimum because all other necessary information can be seen on the website. Bespoke letterpress and foil business cards are becoming more and more popular with individuals and companies who want to present a "serious" professional business card rather than the cheap (or free) generic litho and digital printed cards available online these days from the likes of Vistaprint and Moo etc. COLORPLAN DUPLEX BUSINESS CARDS, 700gsm in Pristine White/Dark Grey - with metallic red foil on both sides. Satin silver text on the dark grey side and opaque grey foil text on the white side. BLUE COLORPLAN CARD in 540gsm with blind debossed logo and opaque grey letterpress text. Colorplan Duplex Dark Grey and Pristine White 700gsm card - with deep gold metallic foil over blind emboss (actually deboss) on front and dark grey letterpress foil text on reverse. • PRICES from £150 for 200 cards, 1 colour 1 side, 1 pass (additional passes/foil colours at extra cost) from supplied black on white artwork - on the G.F.Smith Colorplan range 540gsm ( 700gsm and Duplex also available at extra cost) - 100 cards also available, please ask for quote. • PRICING - with letterpress bespoke foil business cards (unlike other cheaper printing processes using litho or digital print) each colour is printed individually and carries an extra charge (per side) - so the more colours in your design the more expensive the cards. • QUOTES / ORDERS - please see "PRICING" page first - then email me your design MOCK-UP and specifications, including card colour and quantity for a CUSTOM QUOTE. • QUALITY - letterpress foil cards on Colorplan stock need quite a high level of craftsmanship and experience to consistently achieve the highest professional results - all orders benefit from my 30 years experience and are overseen and fine-tuned by myself to ensure the highest possible quality. • CARD TYPE - I normally use only card stock from the GF Smith COLORPLAN range of 50 colours http://colorplanpapers.com/50colours (in 540gsm or 700gsm) - as I believe this to be the best type of card available for luxury bespoke business cards, with 540gsm being the most popular option. The cotton card sometimes advertised for letterpress is too soft and too light IMO (feels like thick blotting paper) - so I do not like to work with this as I believe the end result is inferior. Some printers DUPLEX the card themselves on small duplexing machines, but I alway have my card duplexed at G F Smith paper mill as I feel this is something best done by the experts rather than risk these expensive business cards peeling apart at some point in the future! • QUANTITIES - most customers usually find 100 or 200 (per name) of these very special cards to be sufficient for the people they REALLY want to impress. In many cases clients also order the more economical litho or digital generic business cards for general distribution/marketing and for some other staff members to hand out. • VAT - I have recently down sized my business to specialise in my main area of interest (bespoke business cards) and also de-registered from VAT (after over 30 years of being VAT registered) in order to simplify payment of export orders outside the EU. So VAT is no longer applicable to small orders. • FOIL COLOURS - most colours (both metallic and opaque) are available for hot foil printing - if you want a specific shade please give me a Pantone reference and I can send you a sample of the nearest foil shade - otherwise I will choose the nearest shade available to your mock-up. Please request a foil sample if you are very particular about the shade - not all opaque foil colours are suitable for all Colorplan card colours and may require testing on your chosen card colour - this may add a few days to delivery. If you need a particular opaque shade and no foil is available in a suitable shade, I have the option to print with pantone Letterpress inks. • DESIGN- MINIMALIST contemporary design is best suited to these bespoke business cards. It's usually better to use both sides of the card rather than trying to cram all content onto one side - there's no need to worry about the impression (indentation/embossing) showing through on the other side because when done properly the card will absorb the impression. • ARTWORK /DESIGN - please supply your artwork as individual 100% BLACK on white vectorised PDFs. I do NOT offer a 'DESIGN' service as this can be very time consuming and costly - but if you show me an example of a design you like or a mock-up I can provide simple typesetting for an additional charge. "Author's alterations" may incur extra charge (ie alterations/changes to original instructions). I only offer simple 'typesetting' - for complex artwork/design options please contact a graphic designer. TYPE SIZE - I'm often asked what is the minimum type size for the letterpress/foil process - the answer is 'it depends on the font', but as a guideline around 7-8pts for medium serifed fonts with medium fine strokes. Medium (not bold) sans serifed fonts can be approx 6-7pts minimum. It's best to avoid very light fonts in small sizes as these can be difficult to 'hold' during the plate etching process and also may distort under pressure when printing. When you've placed your ORDER I'll advise you if any of your artwork seems unsuitable for the process. • FOIL EDGES (Gilt or Gilded edges) are available in just about all colours - cost £170 (minimum price for 1 "clamp" up to 250 cards) - this will add approx 6 WD to turnaround. I outsource this element of production to arguably the best gilders in the UK (or maybe the world) with over 100 years experience. Needless to say this is a highly skilled craft and not many firms are able to do this to a consistently high professional standard. Edge foiling is priced "per clamp" which is 250 cards at 540gsm thickness. • EDGE PAINTING - edge painting is a lower cost option to gilt edges, available in all colours - please ask for quote. • CARD THICKNESS - 540gsm is the most popular option depending on card colour and print options. Some colours requiring a blind deboss will benefit from the extra thickness of 700gsm (colours vary in actual thickness even though gsm is the same). In the case of DUPLEXED colorplan I usually suggest 700gsm. If cards are to be GILDED or edge painted, once again I would usually suggest 700gsm depending on card colour and edge colour. • TURNAROUND - Please allow 7-10 working days for stock card colours (Colorplan pristine white, dark grey, ebony black - 540gsm) and approx 10-12 WD for other colours and DUPLEXED colours which are special order from GF Smith - I appreciate your patience. These turnaround times are assuming you supply your own 100% BLACK on white print ready artwork. Edge foiling or painting will add around 5 WD to the above. You'll have your special business cards for a long time - so best not to rush them, and have some cards to be proud of. • EXPRESS DELIVERY - I do NOT offer express delivery for an extra payment as I feel this is unfair to customers who have already paid the standard price. • TERMS: Payment with order please.